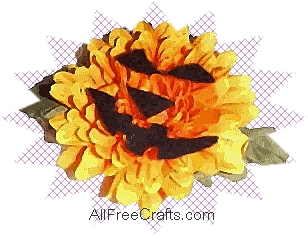 This “Mums” pumpkin pin is super duper easy to make from silk flowers – and wouldn’t this be a nice Halloween corsage for the teacher! Cut the silk mum off the stem. Make three triangles out of the felt. Glue two triangles going up for the eyes and the other triangle going down for the nose. Cut a rick rack shape for the mouth, and glue down. On the back of the pumpkin, glue two leaves joining together and sticking out of the sides of the pumpkin. Glue on the pin back. These are so colorful; they look wonderful on a fall coat. They also make perfect teacher gifts too. If you’re interested in making a Homecoming Mum, check out this pretty version from the CottageInTheSun blog, lush with ribbon streamers. Nice, detailed tutorial with lots of helpful, step-by-step photos.